This is the track for Engineering students on the Master's level, any subject ranging from Electrical Engineering to Microsystems Technology or Mechatronics… Its core part is an Electrical Engineering project which offers the opportunity to conduct a practical research project. In addition to this you will study up-to-date research developments, gain expert knowledge in the field and learn of its application in the engineering industry. You can complete your semester with several electives, such as a Project Lab in Sciences and Technology. 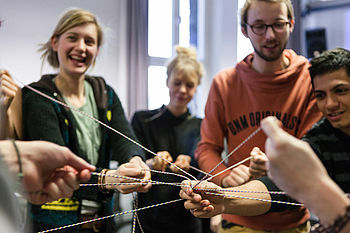 You are an enrolled Master's student at a partner university of HTW Berlin. You have completed a first Bachelor's degree in in the Engineering field, such as Electrical Engineering, Microsystems Technology, Process Engineering, etc. It is understood that basic knowledge in Mathematics, Physics, and Electrical Engineering is expected. An advanced level of C1 in English is compulsory. Check which courses are available.